This week’s 52 Snapshots of Life theme is mischief and I’ve got a story for you about some on-going mischief in my house. While I was cleaning out one of my closets recently, Sadie managed to invent a new game for herself. I had taken everything off of one of the closet shelves and piled the items on the floor around me. Sadie was nearby, watching me work while squeaking one of her little squeaky balls. 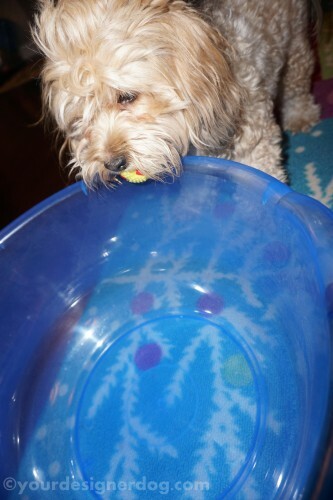 At one point she came over to investigate all the stuff on the floor and dropped her ball into a big, blue plastic bowl. She proceeded to scratch and claw and bark at the bowl like a lunatic until I came over and got the ball out for her. 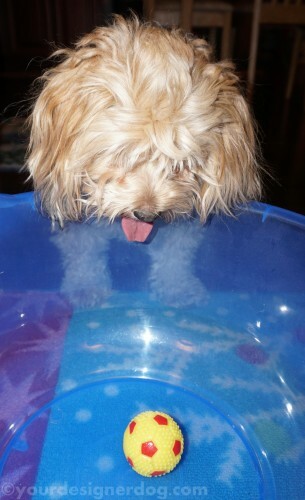 Exactly thirty seconds later, Sadie dropped the ball right back into the bowl. This time she circled the bowl a few times, like she was examining the problem from every angle. Then Sadie began pushing and pawing at the bowl, trying to tip it over. 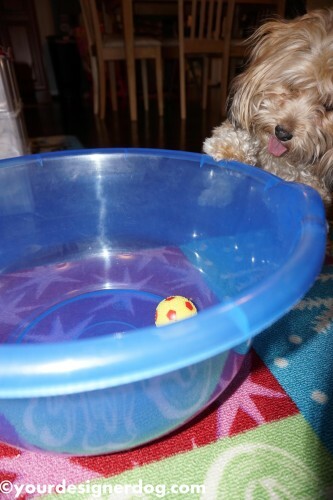 After just a few tries, she got the bowl to tilt enough for the ball to come rolling out. And thus “Bowl Ball” was born. The bowl now officially belongs to Sadie and remains in the middle of my living room floor, where she frequently engages in games of Bowl Ball at least once a day. 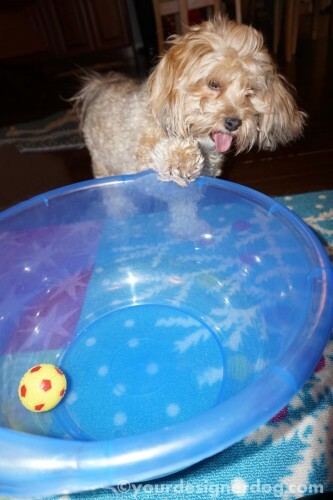 Sounds like a fun game, but I prefer to tip over bowls full of water which is why our water bowls are all slippery sided and don’t have any type of lip! 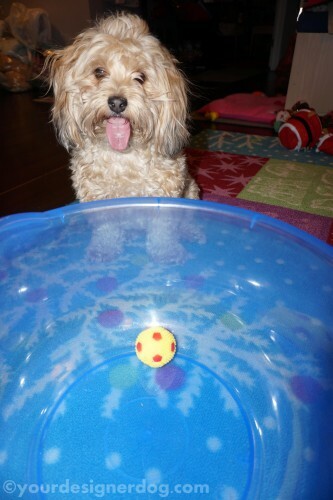 “Bowl Ball” – that is too cute. Love the video! And I love Sadie’s creativity in designing a fun new game! Bowl Ball sounds like a fun game… great video! That is so cute and she is such an inventive puppy. Maybe you should get a job as a toy designer!! I don’t advise ever putting water in that bowl again. MOL! That video is hilarious! Looks like Sadie could enjoy endless hours of that mischief!